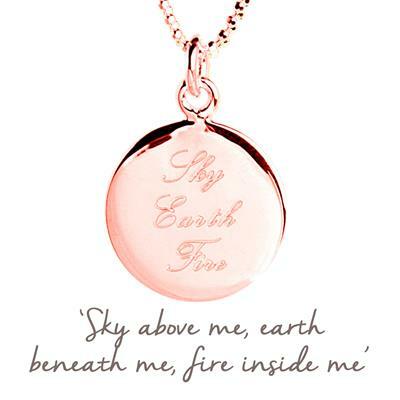 From the fabulous Mantra collection, this 925 Sterling Silver disc necklace is plated with Rose Gold and inscribed with 'Sky Earth Fire' and hangs on a 18-20inch chain. Wear your Mantra necklace to inspire you every day. Perfect if you love yoga, to bring to mind the grounding of the earth beneath your feet; the open sky above your head; and the energy centre inside you. Repeat the mantra to focus on the earth grounding you, and the fire igniting inside you.